Two years later, Foxconn has been handed billions in subsidies, despite its long history of broken promises on factory rollouts, through which it absorbed titanic fortunes from governments and then delivered only a fraction of what it had promised (or nothing at all). 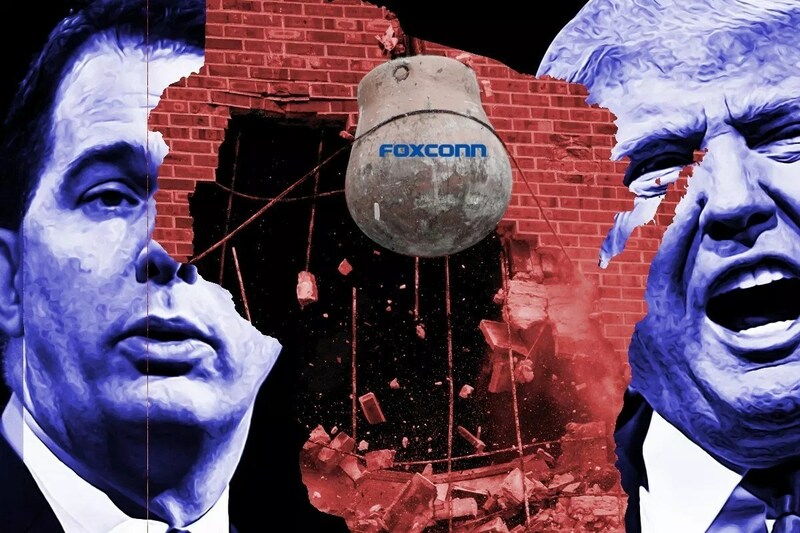 Foxconn is holding true to form in Wisconsin: after receiving huge infusions of public money, after convincing cities to bulldoze people's homes to make way for its "factory," after flip-flopping on whether there will be a factory, the company has no definite plans. Instead, Foxconn keeps on fronting little convincers, like announcing that it is buying a bunch of buildings around the state to use as "innovation hubs" or "incubators," then either quietly reneging on the purchases, or leaving the buildings sitting empty. Meanwhile, it's painfully obvious that the local and state governments got scammed. Foxconn is not going to build an LCD plant in Wisconsin because there is a global gut in the supply of LCDs and Foxconn is operating its own LCD plants well below capacity due to the lack of demand. The fact that Foxconn is promising an "AI 8K+5G ecosystem" -- a meaningless buzzword only missing the word "blockchain" to score a perfect Gartner Hype Cycle bingo -- should ring alarm bells for anyone who's paying attention. The smart money is on the idea that if they delay until 2020 -- so that Trump can talk them up as a success story when he fights for re-election -- that no one will mind much if they quietly back away from their ambitious plans, pocket all those billions, and build out a small R&D center or, I dunno, a packing plant or something.